Summary: Charlotte and Ben take turns being #1 on the leaderboard of their online Scrabble game, but things aren’t going as well in the rest of their lives. Charlotte’s father has had a heart attack, and she overhears her best friend making mean comments about her to some new friends. Ben’s being bullied at school, and has a disastrous experience running for student council president. The two of them occasionally talk on the phone, creating better lives for themselves that they present to each other. The whole story takes place during one week, and by Saturday, both Ben and Charlotte have survived their crises and taken tentative but promising steps toward new friendships. 304 pages; grades 3-7. 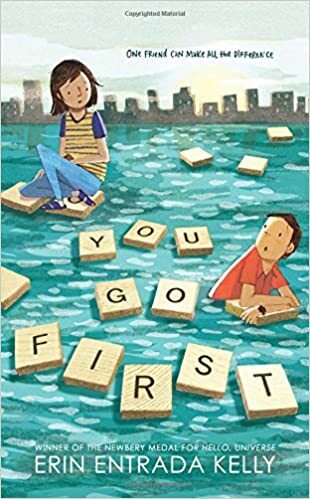 Pros: It can’t be easy to release a new book two months after winning the Newbery, but Erin Entrada Kelly’s follow up to Hello, Universe is an engaging story about two likeable kids going through some painfully difficult times; personally, I enjoyed it at least as much as Hello, Universe. Cons: It’s a pretty quiet, introspective book; readers seeking a lot of action may be disappointed.